J. & J.Colman Ltd, in business since 1814, was well aware of the enormous dividends to be reaped from investment in advertising their yellow tins of mustard powder. One of their long term promotional items was a series of booklets that was given away free to children every Christmas from the 1880s into the 1950s. "Children treasured these booklets. For many they were the first and only books they ever owned." Rhymes and Tunes For Little Folks is a 20-page booklet, 4 1/4 x 5 1/2 inches, with 16 nursery rhymes, musical scores with lyrics, and 12 colour illustrations. The first page inside the front cover shows "J. & J. Colman's Xmas Greetings to Their Young Friends All Over the World". 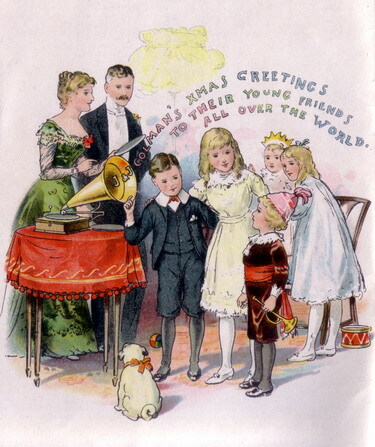 Loosely adapted from Francis Barraud's painting, it depicts the familiar subject of the little terrier, Nipper, listening intently to the recorded message emanating from a Berliner "Trademark" Gramophone. The talking machine may not be an exact rendering of the Type B Berliner, but the artist is clearly familiar with the model showing a brass horn, side brake, and external spring box mounted on the back, with a crank handle on top. In this rendition Nipper, with two black-tipped ears, is placed prominently in the foreground, but he is not the focus of attention. The boy in the paper party hat with a trumpet is centre stage, in his Little Lord Fauntleroy suit. Mothers had imposed this fashion on boys since 1886 when Frances Hodgson Burnett published her popular children's novel. This is an early use of the Nipper theme. 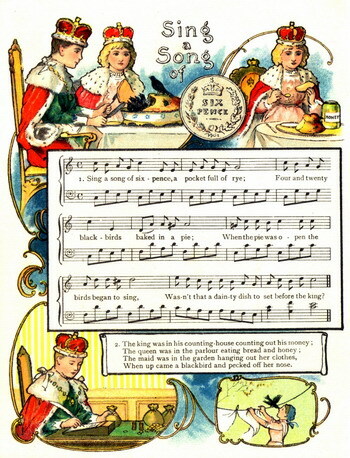 Page 3 of the booklet, "Sing a Song of Six Pence", showing the king and queen, confronted with a hopelessly underbaked blackbird pie, conveniently dates the illustration with the depiction of a sixpence coin of 1902. From 1880 to 1939, Colman's issued special pictorial tins every year, including one for Edward VII's coronation in August 1902. Colman's industrialists were collectors of landscape paintings by various artists in East Anglia throughout the nineteenth century. Their collection is still displayed in the Norwich Castle Museum and Art Gallery. By 1902, they commissioned printers of this booklet to use different illustrators of childrens' books. Perhaps Cecil Aldin or John Hassall were amongst those chosen to do the artwork. Were these artists acquainted with Francis Barraud and his studios in Liverpool and Piccadilly? Barraud often exhibited with other artists at the Royal Academy, London, or The Institute of Painters in Oil Colours. Barraud completed his famous painting in 1899. On December 5 of that year the first prints of photographs of the painting were available in London. By the end of that month these reproductions were circulated in trade literature, including a Christmas 1899 Gramophone Company advertising card. In January 1900, "His Master's Voice" made its initial appearance on a Gramophone Company record advertising supplement. Also in that year Barraud exhibited a 10 x 12 inch watercolour of his painting at the Royal Institute of Painters and Watercolourists in London where it sold for 15 guineas. Emile Berliner is thought to have seen the original "His Master's Voice" painting on a visit to England in early 1900. On May 26 he applied to register the picture as a trademark at the U.S. Washington Patent Office, following in July with registration at the Canadian Patent Office. Berliner's required statement during his patent application said he had been using the picture of the dog listening to the sound reproducing machine continuously in his business since May 24, 1900. Its very first appearance on records was in Canada in the Fall of 1900, stamped on the back and in the grooves of 7" Berliners. By March 1901, Nipper started to appear on items such as Eldridge Johnson's Victor needle packets. In October 1901, Johnson used the Dog on his company letterhead and by May 1901, Nipper appeared on most of their goods. So, the endearing painting of "His Master's Voice", soon to become famous all over the world - some say the most recognizable trademark ever - was an apt and topical subject for the Colman's group of artists and their series of seasonal nursery books for little folks. Archives, Unilever Company, Port Sunlight, England, Nov. 30, 2006. John Rutherford, December 2, 2006, personal communication. In the 1930s John Rutherford went to school with artist John Hassall's son, John Hassall Narbeth. His Father was best known for advertising posters and other ads for Colman's mustard.